Last month, I had the opportunity to volunteer at the “Living the American Dream” Gala, in Sacramento, CA. The event was presented by LULAC’s Lorenzo Patiño Council #2862 of Sacramento and Hermandad Mexicana Transnacional (locally known as Hermandad). Hermandad is a local nonprofit organization that has a decades-long history of serving the community of Sacramento. The gala celebrated and recognized newly naturalized U.S. citizens, scholarship recipients, and distinguished community leaders. Individuals from many different backgrounds attended the event, including key government, business, and media leaders from the Sacramento area. As a volunteer at the event, I learned more about the great work of these two leading organizations. 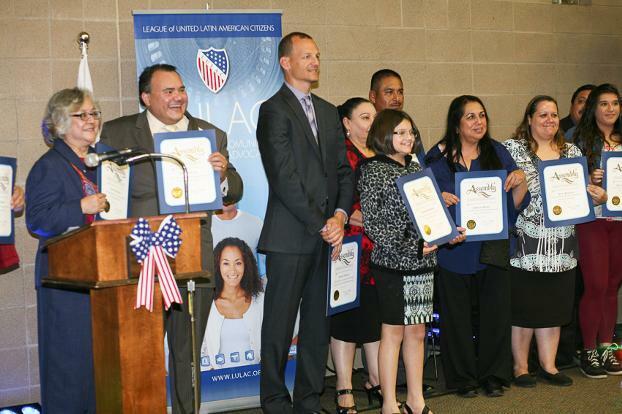 The LULAC Lorenzo Patiño Council has served the community of Sacramento for over thirty-two years by promoting higher education opportunities and defending the civil rights of the local community. The council partners with local charities and Latino organizations in the Sacramento area. In addition, the council awards annual scholarships to local college-bound students. Similarly, Hermandad provides low-cost legal services to immigrant communities as well as education, economic, and community development programs. For the past two years, Hermandad has also been a grant recipient of the Hispanic Immigrant Integration Project (HIIP), which was created through a partnership between LULAC, the Hispanic Federation, and the Walmart Foundation with the purpose of providing immigrant integration services to communities across the United States. A highlight for me was observing how LULAC’s Sacramento Council and Hermandad Mexicana Transnacional are helping Latinos live the American dream by providing them with scholarships, immigration services, and many other opportunities. Coming from an immigrant family, I witnessed my undocumented family members struggle as they navigated through the broken U.S. immigration system. It took my family ten years of sweat and tears to become U.S. residents. Immigration is an issue that I am deeply passionate about, and I was very happy to see how LULAC’s Lorenzo Patiño Council and Hermandad are making a difference in the lives of immigrant families through their services. As an intern, I have helped redesign the Hispanic Immigrant Integration Project (HIIP) Handbook. This program is helping hardworking Latinos gain access to the American dream by providing free access to U.S. history and civics classes along with application assistance for naturalization, Deferred Action for Childhood Arrivals (DACA), and family- based petitions. In 2014, the program helped more than 1,881 individuals successfully complete civics classes or the application process for naturalization, DACA, and family petitions. Observing the gala, and witnessing the direct impact of Hermandad’s work on my surrounding community through the testimonies of HIIP participants was truly an honor. HIIP has helped countless individuals attain U.S. citizenship, work authorizations, and social security numbers. Through their newly acquired statuses, individuals have access to higher education and occupations which ultimately provide better lives for them and their families. I now see how the work that I undertake as an intern can help a community that I deeply care about. I am energized to work harder than ever to ensure that LULAC is offering the most effective programs to ensure better lives for the immigrant community. Jessica Velasquez is the Community Programs Intern at the LULAC Regional Office in Sacramento, California. Jessica is a fourth year student at the University of California, Los Angeles majoring in Chican@ Studies and Political Science and will be graduating in Spring of 2016. When I first decided that I wanted to intern for the League of United Latin American Citizens, I knew that this was the largest and oldest Hispanic civil rights organization in the country. I was also aware of its work to advance the lives of Latinos throughout the United States; however, I did not know just how extensive their reach was. During the first week of my internship with LULAC, I was able to observe first-hand how LULAC advances the economic condition, political influence, and education of the Latino community in the halls of Capitol Hill. Throughout the year, LULAC has many national events, but one of its most unique events is ACTober: Fall Advocacy Day. ACTober occurs every October and allows LULAC members from councils across the country to meet with members of Congress and leaders from President Obama’s administration to discuss LULAC’s policy priorities. LULAC members from dozens of states across the country held meetings with congressional leaders from both political parties because bills often need bipartisan support. In addition to taking the time and effort to travel to Washington, D.C. and speak with their representatives, many of these council members are leaders in their local communities, giving them specialized knowledge on what needs to be changed at the federal level to affect change locally. Amongst the various meetings held throughout the entire day, I was fortunate enough to attend a meeting with the legislative correspondents of Congressman Thomas Rooney of Florida and Senator Lamar Alexander of Tennessee. I accompanied LULAC members who wanted to discuss federal legislation that would address educational inequities in the classroom. We looked specifically at the Senate's “Every Child Achieves Act” and the House’s “Student Success Act”, and advocated for a provision which would hold states, schools, and districts accountable when they fail to meet educational target goals for Latino students and English Language Learners (ELL). Subgroup accountability is critical to ensuring that schools will do everything in their power to ensure the educational success of vulnerable student populations, including minority students, students with disabilities, and English Language Learners. In addition to a subgroup accountability amendment, we also spoke on the need to use annual assessments to track the progress that students make. While there is a danger that students are often over-tested, especially in elementary school, LULAC supports administering one test so that results can be used as evidence of any achievement gaps for Latino students. If a disparity exists, the state and/or federal government can take action to give these students resources and additional support to close the gap. Whether focusing on immigration detention issues, equal rights for the LGBT community, or Latino health issues, LULAC not only speaks on the importance of these issues, but they actually go to Congress and speak to their representatives. By telling them what the Latino community needs, they are ensuring that elected officials can make the necessary public policy changes to address these needs. Even though they might not necessarily agree with all the congressional members they are meeting with, LULAC members can still have a proactive discussion on addressing the needs of the Latino community and ensuring that what is going on in local communities across the country is heard by those charged with creating the laws.